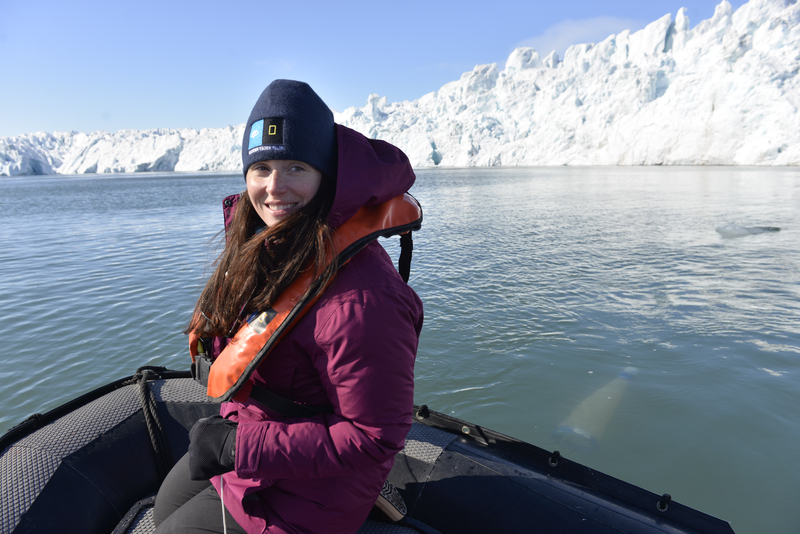 The following post was written by 2014 Grosvenor Teacher Fellow Cristina Veresan during her expedition to the Arctic. The Grosvenor Teacher Fellow Program is a professional development opportunity made possible by a partnership between Lindblad Expeditions and National Geographic Education. In fact, most scientists classify polar bears (Ursus maritimus) as marine mammals. 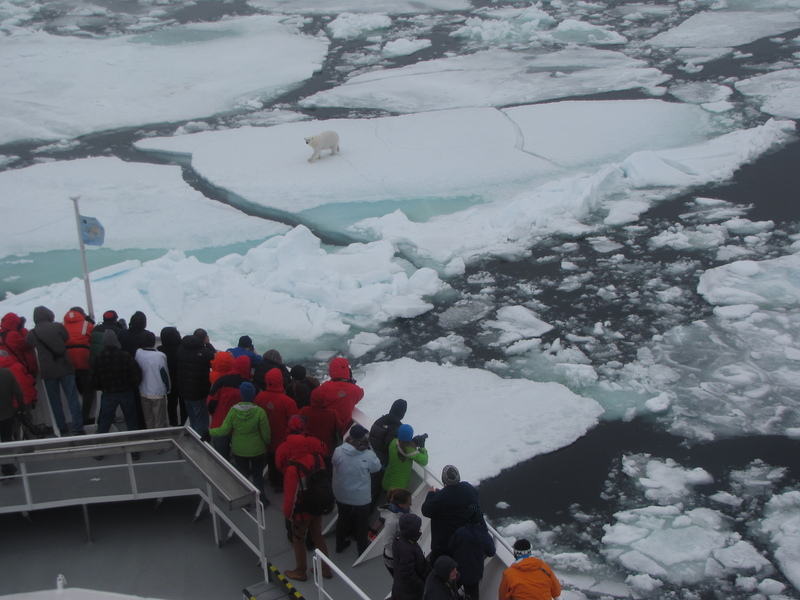 Guests and staff gather on the bow of the National Geographic Explorer for polar bear viewing. Photograph by Cristina Veresan. In the pack ice of northern Edgeøya, ice floes of all sizes dotted the blue sea surface like scrambled white puzzle pieces. I leaned over the side of the Explorer and a polar bear’s dark eyes held my gaze for a moment before she looked down and lumbered alongside the ship. For the next hour, I observed this young, curious female bear’s behavior: rolling around in the snow, hugging a chunk of ice, and yawning. The deck was filled with staff and guests who pointed lenses of all sizes at the bear. People stared in reverence, silent except for their camera shutters clicking. 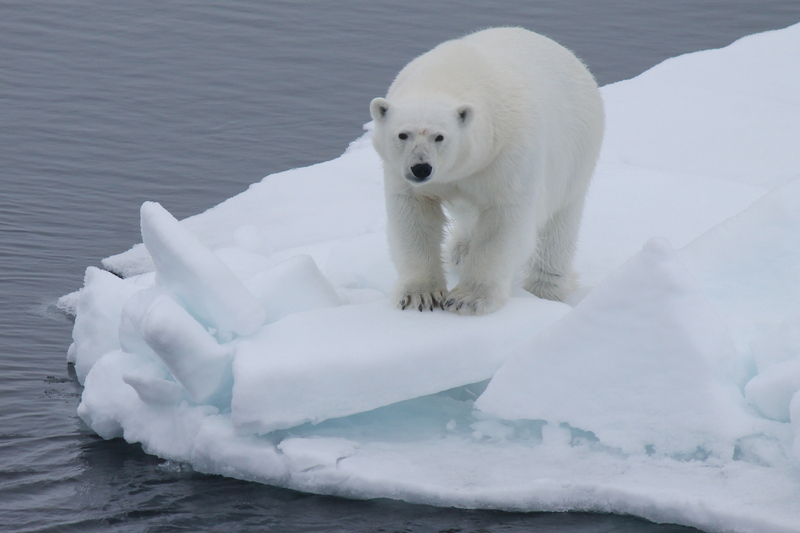 Fur, a tough hide, and a thick layer of fat insulate polar bears against the frigid air and sea temperatures. Eating mainly a diet of blubber-rich seals hunted from the sea ice, polar bears can weigh up to 1500 pounds and are the top predator of their ecosystem. In fact, these carnivores get their water from the chemical reaction that breaks down the fat they consume, so they do not even need to drink water. Polar bears are known to be excellent swimmers, powerfully moving through the water with their paddle-like paws. In fact, most scientists classify polar bears (Ursus maritimus) as marine mammals. I watched the bear move with ease between water and ice, using her sharp claws to grip ice floes and pull herself up. Polar bears are well adapted to the harsh Arctic environment, and their survival is intimately linked to the fate of the sea ice. Since sea ice is under threat due to global climate change, how many more generations will get a chance to view this Arctic icon, the polar bear, in its natural habitat? Meeting the gaze of the icon of the Arctic, the elusive polar bear. Photograph by Cristina Veresan. As keen as I was to observe Svalbard’s macro creatures, I was also interested in finding the micro life drifting undetected all around us. To do this I needed a plankton net, a funnel shaped, fine-meshed net connected to a plastic bottle. When the plankton net is towed through the water, a concentrated sample of plankton is collected in the bottle. I conducted my plankton tow from a Zodiac boat as we cruised by Idunbreen glacier, gripping the towline as the plankton net streamed behind me in the icy water. Back on the ship, I went up to the observation deck with microscopy supplies and the plankton net’s plastic bottle, now teeming with plankton. Over and over, I placed a slide containing a small amount of seawater under the microscope and the seemingly alien plankton forms were revealed. Intricately woven green globes, spiny jointed creatures, and spiraled shells floated in and out of view. Plant plankton (phytoplankton) use energy from the sun to photosynthesize, so they are their ecosystem’s primary producers. Tiny animal plankton (zooplankton) eat the phytoplankton and are eaten by other zooplankton and then other animals. We all depend on plankton not only for supporting marine food chains but also for the oxygen that phytoplankton release during photosynthesis. Considering how much of our Earth is covered with seawater, does it surprise you that tiny plant plankton provide us with about 60% of the oxygen we breathe? 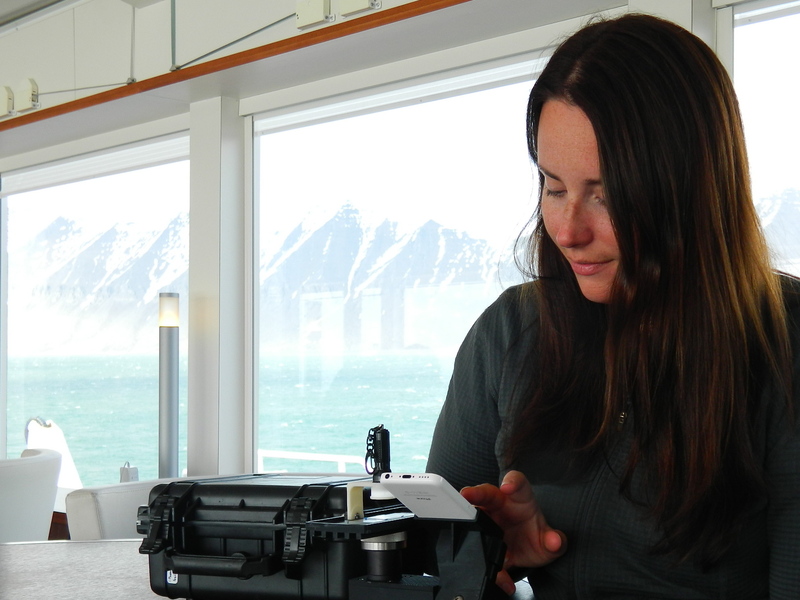 Cristina conducting a plankton tow from a Zodiac in the high Arctic. Photograph by Sisse Brimberg, KEENPRESS. Cristina observing plankton specimens under a microscope. Photograph by Ellen Taylor. On my Svalbard expedition, I encountered the very bottom and very top of the Arctic food chain and many links in between. In addition to polar bears and plankton, I also had the opportunity to see walrus, fin whales, bearded seals, arctic fox, tundra wildflowers, Svalbard reindeer, and many different sea birds. I learned about the ways in which this wildlife is interconnected with each other and, ultimately, with us. My challenge and yours is to explore our local environments and discover its fascinating array of living things, including those highly visible and those yet unseen. This post is one of our selected stories from teachers who have seen incredible environments — to bring the experience back to their students. Learn more about how you could become one of the next Grosvenor Teacher Fellows. Applications will be available in December for the 2015 program.